As a keen runner and dog owner, I jumped at the chance when canicross teacher Hayley Empett invited me to join her Dogfit group in Ashford, Kent, to try the sport out for myself. It seemed like the perfect activity to enjoy with my energetic 18-month-old Cockapoo Saffy. Dogfit hold a series of canicross classes in Surrey, Kent, Sussex and South London, where participants can try out the sport in a small group under the guidance of a trained instructor. Hayley runs introductory canicross classes as well as Couch to 5K courses for beginners and longer distance runs for intermediates. The Couch to 5K is based on a popular running programme that features a mixture of walking and running designed to help novice runners build up to a 5K distance – but with Hayley’s class you run with your dog! Any breed of dog can try it but they need to be 12 months or older. And children can take part as well as adults. The classes normally take place at a forest but on the day of my visit, Hayley’s regular class were taking part in their local Park Run along with their dogs. Seeing as Saffy and I had never run together before I felt a little nervous, but Hayley was very reassuring. Saffy and I were both given a harness to wear. Hers fitted over her shoulders in a similar way to a dog-walking harness, while mine fitted round my waist like the type I wear when I go indoor rock climbing. We were then joined together by a stretchy bungee line which would give us the flexibility to run together without causing Saffy any discomfort. As we took our places at the start line I was pleased to see about 10 other dogs of all shapes and sizes from a little Yorkipoo and a Jack Russell to a Labrador and a Lurcher. The runners themselves were of mixed abilities and extremely friendly, so I immediately felt at ease. 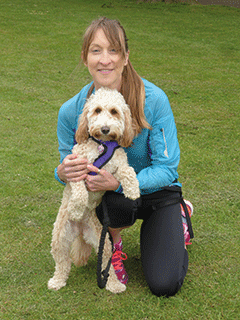 Hayley, who runs with her Hungarian Viszla, Wilson, gave me a few pointers to follow as we waited at the start line. Hayley also advised me to concentrate on the route and give Saffy some guidance on where to run. “They can end up shooting off in a different direction to you if you’re not careful,” she said, as I had visions of the pair of us ending up in a hedge. As the race began, the dogs surged forward, and Saffy naturally began to follow the pack. We all charged along in a blur of colourful lycra and wagging dog tails. Then, we came a cropper. My husband Ed was standing on the sidelines, taking photographs, and Saffy decided she didn’t want to run without him. We quickly realised that Ed would need to run the race with us – dressed in ordinary shoes, a coat and clutching my handbag! It was an unconventional approach but with Ed running slightly in front Saffy quickly got into her stride and soon turned into the canine equivalent of Mo Farrah. Normally I run at a 9.30 minute mile pace, but attached to Saffy the speed runner, I found myself flying along a whole minute faster per mile. Hills have always been a challenge for me, but with Saffy’s help I charged up them and then flew down the other side, fuelled with adrenaline. All too quickly the race was over, and as I got my breath back, Saffy enjoyed a huge drink of water and some special doggie treats provided by Hayley. I was red-faced and puffed out – but completely hooked. As we headed home for a well-earned cup of tea and a dog biscuit, I was already making plans to find a local canicross class. The sheer joy of charging along in the open air with my beloved doggie had been absolutely exhilarating. It’s an activity that dog owners and runners should definitely try – you’d be barking mad not to! Canicross originated in Norway from the sport of skijoring, where skiers are towed along by their dog – the dog and human being attached together via harnesses. During the summer months, when the snow melted, the skijor teams wanted to keep up their fitness levels, so they swapped their skis for running shoes and the art of canicross was born. The first UK canicross race took place in 2000 and in 2006 CaniX UK held the first UK National Championship. Since then the sport has grown in popularity with events taking place all over the country and more running events are now allowing competitors to run with their dogs.